The gospel is the good news of redemption through the propitiatory (serving or intended to appease God’s judgment towards sin) offering of Jesus Christ for one’s sins. The announcement of Jesus’ birth gives us the purpose and intent of His incarnation. In Luke 2:8-14 an angel announces the Birth of Jesus the Christ as “good tidings of great joy which will be to ALL PEOPLE.” A Savior who is Christ the Lord was born. Salvation cannot be found in religious rites, nor in the merits and works of man, nor through the keeping of the law. It is the Gift of God freely given to any and all who believe in the finished work of Jesus Christ upon the Cross. Scripture tells us; “But when the kindness and the love of God our Savior toward man appeared, not by works of righteousness which we have done, but according to His mercy He saved us, through the washing of regeneration and renewing of the Holy Spirit, whom He poured out on us abundantly through Jesus Christ our Savior, that having been justified by His grace we should become heirs according to the hope of eternal life” – Titus 3:4-7. What does it mean to be ‘justified’ (Rom. 3:20 )? Justified means ‘declared righteous’ (Just-if-I’d-Never-Sinned). This is even better than innocent. If you are justified you can point to Christ at God’s right hand and say ‘I belong to Him, that’s why I’m righteous’. Innocent Adam could not do this. So, if someone wanted to condemn you as guilty, he would first have to condemn Christ as unrighteous – and this is impossible. So how can anyone be justified then before God (Rom. 3:22-25)? As far as we are concerned, only by faith. As far as God is concerned, only by grace. By faith means that we trust in Christ, that He has paid the price for our sins and that this is enough. By grace means that we can only accept, we cannot do anything and we cannot add anything. But we are also justified by blood. By blood means that the Lord Jesus had to die (as our substitute). Ephesians 2:8-9; 13 demonstrates this a little better. ‘Propitiation’ or ‘atonement’ means ‘covering’ (in Hebrew). In the Old Testament it was used for the lid (‘cover’) of the ark of the covenant. The tables of the law were in the ark (declaring that man was guilty). The cherubim looked down onto the golden lid of the ark which speaks of the immaculate glory of God (so they had to acknowledge that God had to condemn man). But then the lid of the ark was sprinkled with blood (Lev.16), the blood of an innocent victim, shed for a guilty people. So God could spare His people. 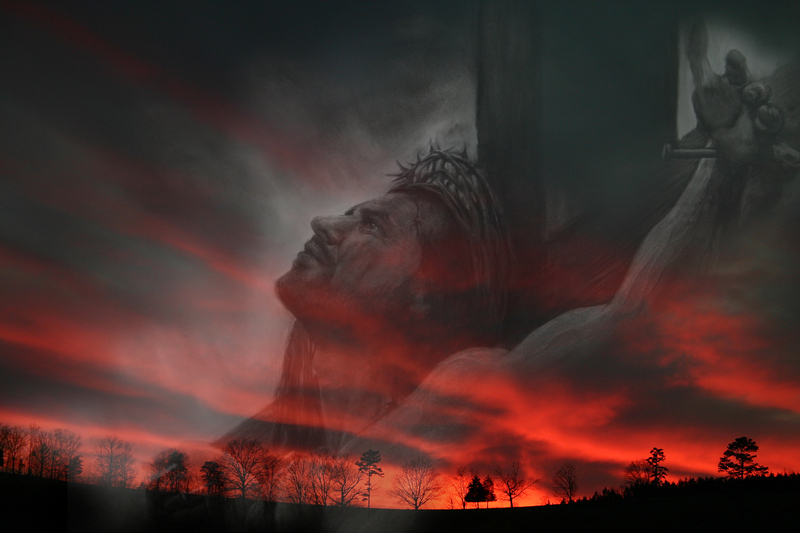 This is a picture of what Christ has done: He gave his life, His blood was shed, so that God does not have to judge us. We are ‘covered’ by His giving his life for us. Why did Christ have to be raised for our justification? The work of Christ was done when He said ‘it is finished’ and delivered up His spirit (John 19:30 ). But without His resurrection, how would we know that His death was sufficient for God? Now that Christ is raised we have the proof. God was fully satisfied with Him and accepted His work (Romans 4:25 ). The carnal man is typically concerned only with forgiveness and with not having to pay the cost of his actions. There is little, if any, contemplation of what happens after forgiveness—or why God gives forgiveness in the first place. For its true significance to be understood, Jesus Christ’s death must be seen within the context of all that God is working out. God is in the process of accomplishing much more than merely “saving” mankind or forgiving mankinds sins! Romans 6:23 explains how far sin separates man from his Creator: “For the wages of sin is death, but the gift of God is eternal life in Christ Jesus our Lord.” Sin, being the opposite of all God stands for, causes the bitter harvest of death to be reaped. Yet, even though He is under absolutely no obligation to do so, God gives the gift of eternal life (Jesus Christ) to pay the debt that every man incurs: the debt of his own, sinful life. Most people believe that “eternal life” means “living forever.” However, length of life is only one aspect of eternal life. Satan and the demons will live forever, but their quality of life is the farthest thing from desirable! They do not have quality of life, because they are in constant disagreement with God—the source of eternal life! Paul tells us in Romans 6:23 that God’s gift is eternal life, and in John 17:3, Jesus defines that gift further: “And this is eternal life, that they may know You, the only true God, and Jesus Christ whom You have sent.” God’s gift, then, is a life wherein a person knows—understands, has experience with—the Father and the Son. The gift is a life that not only stretches on forever, but also has a spiritual quality that makes such length of days desirable! That eternal quality—that perfection in living—has its only source in God, and a relationship with that supreme Source is only possible when man’s sins, the cause of the great gulf between man and God, are atoned for. For this reason, God sent His Son to pay the debt of mankind’s sins, so that man might know the Father and the Son in an intimate relationship, and be able to live life as They live. With the true acceptance of Jesus Christ—that is, receiving His sacrifice—comes the power and authority to become a child of God! The eternal life that God gives as a gift is within the context of a family relationship. God plainly shows it is His purpose to increase His divine Family by bringing many children into it (Hebrews 2:10). Notice that following repentance is the remission of sins, which baptism signifies, being a symbolic dying to sin and resurrection to a new life (Romans 6:1-12). This is why on Pentecost Peter instructs the assembled crowd, “Repent, and let every one of you be baptized in the name of Jesus Christ for the remission of sins; and you shall receive the gift of the Holy Spirit” (Acts 2:38). Repentance is a prerequisite to belief. What is repentance? Its basic meaning is “to change one’s mind” or “to turn.” Once a person hears the gospel and is convicted that his way of life is wrong, he must change his present behavior and “bear fruits worthy of repentance” (Matthew 3:8). The fruit of Repentance can be summed up with three verses of Scripture. Denying ungodliness and worldly lust signifies that we act in a responsible manner, sensibly and prudently. Depending of God’s grace (godliness is impossible any other way,) we exemplify self control saying no to worldly attitudes and behavior and yes to righteous and godly living. This includes being submissive to the governing authority of God’s Word (the Bible) in our lives. The key part of godly living is an eagerness and readiness to do good works! Grace is much more than just the unmerited love and favor of God upon us, the Greek defines Grace as the Divine influence upon the heart and it’s reflection in one’s life. Grace is seen, lived before others as an example and testament to the love of God and His Salvation through Jesus Christ.